When we think of velvet, we might think of luxurious settings, or perhaps our favorite winter dress as a little girl. Not anymore! Velvet is everywhere and works on everyone. Fancy these velvet gold tie-dye bells? They're lightweight enough that you can throw them on for a summer night. Beach Babes, you want this. Pick them up from Liza Jane Handmade. Oh! Blue velvet! What's better than velvet swimwear? Uh... nothing. SHAN swimwear has this up for grabs right now! Don't stop at bell bottoms. Pick up velvet accessories to add a little texture and interest to any outfit. Try this clutch (Call it what you want. It'll hold anything you put in it!) from Herschel Supply Company. Want bells with a little more volume? Try these from TempleRo. They are so comfy, so cosmic, and I can throw them on with a fun top or even a muscle tank. If you're looking for luxurious, unique pieces, check out The Ivy. They have casual, comfortable clothing, as well as formal and bridal collections. While the company is really geared toward modest, cultural designs, there are some gorgeous pieces here that anyone would want to wear. Yeah, suckers, I know there's no wax on that old classic surfboard, but there's about to be!!! 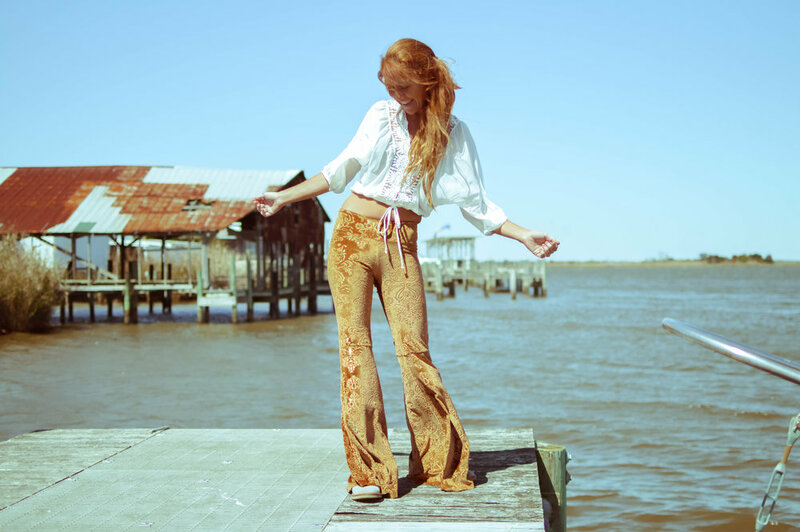 Right after I take off these pretty rad bell bottoms from Liz Jane Handmade!